A birthday card out of the blue from his estranged father sends successful Seattle marketing man Alex Chernoff on a detour to Sweetheart in search of answers about his past. A day, maybe two, to tie up loose strings and he’ll be out of there, heading for Mexico, margaritas and blondes in bikinis. What Emma doesn’t count on is chemistry—of the romantic kind. What Alex doesn’t count on is meeting the girl who’ll make him want to change his ways. But when he learns that he’s a secret from his father’s real family, he can’t stay in Sweetheart… even if he wants to. I loved how Emma and Alex fist lay eyes on each other in The Secret Son by Joan Kilby, and the sassiness Emma exhibits from the start! But underneath that sassiness is a caring, smart, loyal lady. This is well demonstrated as Alex and Emma run into each other again and again in small town Cherry Lake. I loved how their relationship unfolded, and Joan managed to make it seem like a natural thing in short time. Neither of them expect to find romance in Cherry Lake...but romance finds them anyway. It is a difficult one to move forward with, because the future is so uncertain. They just seem so right together that I hoped with everything else happening something positive would come of Alex's time in Cherry Lake! I really liked both of these characters and how they were together. Emma cares, and she just seems to get Alex. When she figures out the secret Alex is hiding she felt for him just as much as I did. The main plot of Alex finding his father after many years is woven nicely with the romance of Alex and Emma, and I felt that these two things gave the book a lot of strength. I really felt for Alex, he stole a piece of my heart - little boy Alex and grown up Alex. The feelings are whirling in him and he's not sure why what happened happened, or what really happened. I did like how he dealt with meeting his father and his father's family, even though it made his heart ache a little more at times. I found both of the main characters to be mature, fun, and despite some issues, full of love and hope. This is what made me like them, connect to them, and feel with them! The secondary characters in this book are mostly Alex's father's other family, and they too were amazing! They added a lot of depth and counter balance to some of what Alex was feeling. An emotional, well paced read that drew me in as quickly as I could turn the pages, I'd recommend The Secret Son to any romance reader. 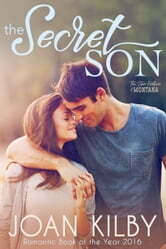 Although part of the Secrets of Cherry Lake series, The Secret Son can be read as a stand alone. A great start to a a new series , Secrets of Cherry Lake. Alex receives a birthday card from his estranged father out of the blue. Alex is tired of his life style and ready to make a change. He packs up for a week to go to Cherry Lake, where the one week will change the rest of his life. What he does not expect to find is the chemistry between him and Emma, nothing like he is use to. But will it be enough to keep him in Cherry Lake, along with the secret that his dad kept for all of these years. This is book that will leave you with tears, happy tears that is. Have tissues on hand. Love the characters of Cherry Lake. Can't wait to read more of their stories. I received this book from netgalley for an honest review. In life there are surprises around every corner. Secrets waiting to be revealed. Some good and bad. Some happy and sad. The Secret Son by Joan Kilby takes a look at hidden truths. Alex has always had unanswered questions about himself. The one person that can answer them is the father he longs to know. But finding answers opens the lid to many other unrevealed truths that may affect others. I liked this story. Ms. Kilby takes the reader through Alex's inner struggle with trying to do the right thing without hurting others. She also brings into his life Emma who is dealing with her own insecurities but serves as stabilizing force for Alex. The Secret Son is a look at how actions and secrets have ripple effects.